For me Samhain doesn’t really start until sunset on October 31st. The Celts marked their days from sunset to sunset. Some have hypothesized this in honor of Bile, a god connected to the Underworld and often seen as Danu’s counterpart. Marking the days from sunset to sun may have been a way to remember that they came from the darkness of the Underworld (Bile’s realm), and that all things have to pass through darkness to come into light. Whatever the reason I find myself contemplating this concept as we approach Samhain. Having the new day begin at night may seem odd to us today. We think of our days beginning in the morning with the rising of the sun, but we aren’t that different from the Celts. The new day technically begins at 12 am, a time of darkness, so even today we acknowledge that the day begins in the depth of night. We tend to think of death, darkness, and the Underworld as the end of the journey. But really it is our starting point. We are born out of darkness, and to it we return to begin again. We spend nine months in our mother’s dark watery womb before coming into the world of light and life. The seed germinates in the dark rich soil before it reaches up towards the light of the sun. We survive the cold and long dark days of winter, to reap the fruitfulness of summer with it long days of warm sunlight. When must pass into darkness of the Underworld to be reborn. All things come out of darkness. Through the darkness of Samhain night, the new year is born. 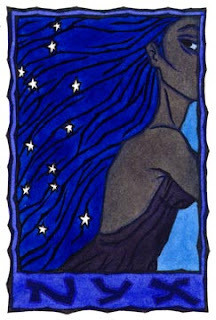 Although she is not a Celtic goddess, Nyx, the Greek goddess of night has been on my mind the past few days along with the idea of seeing night and darkness as a beginning. She was a primordial goddess, one of the Protogenoi (the first-born elemental gods, who made up the basic components of the universe, which included earth, sea, light, day, and time). She was the mother of Eris the goddess of chaos, and Thanatos the Greek personification of death, but with Erubus (the god of shadows and darkness) she is also the mother of Hemera the goddess of day. At times she is prophetic, dispensing prophesies from her cave beyond the sea (at times her cave is at the end of the cosmos). She is depicted either riding in her chariot, trailed by stars or a woman with black wings. In her mythology she is a force to be reckoned with. Even Zeus, the king of the gods, listens when she speaks. Each sunset and sunrise she passes by her daughter Hermera as they exchange places. That moment as night becomes day or day becomes night is that only time the goddess of night can greet her daughter who ushers in the day. I find it interesting that the goddess of night gives birth to the goddess of day. To me it mirrors the Celtic idea that light can only be born out of darkness. While today we think of day preceding night, our ancestors saw darkness as the beginning of all things. They knew we needed to pass through darkness in order to find light. Whether it is our inner darkest or a dark time in our lives, we must pass through darkness in order to find light and new beginnings. Dawn would be meaningless without the long journey through the night. Mother Night hear my prayer! Light the candle and let it burn out. If you can not let it burn all night (in a fire safe container of course) light it for a few minutes each night until it is spent. Thank you for the info on Nyx and for the wonderful spell.